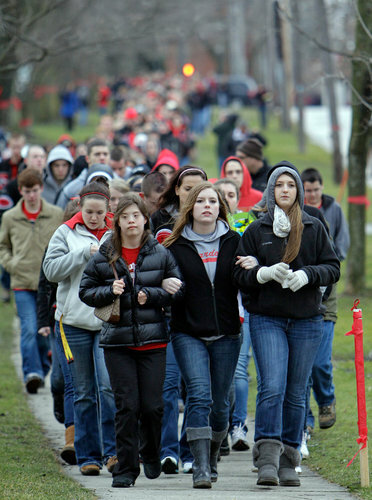 Three days after the school shooting rampage on February 27, 2012, students marched to Chardon High School in Ohio paying tribute to those killed and wounded. This entry was posted in Uncategorized and tagged Chardon High School, Chardon Ohio, Cleveland suburb, community, Geauga County, loss, march, marching, mourning, murder, pain, procession, rampage, school shooting, solidarity, strength, students, tribute, walking. Bookmark the permalink.